Mirah Belle introduces unadulterated, pure essential oils that improve the health of your skin, hair and body. These 100% Pure Essential Oils offer a variety of benefits from cosmetic, dietary purposes and are known for their healing effects mentally, physically and emotionally. 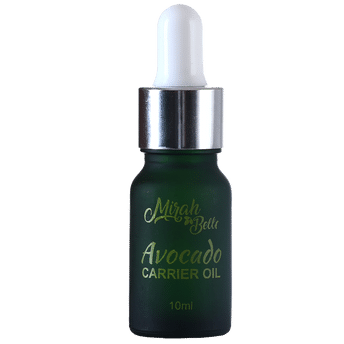 Mirah Belle's Avocado Essential Oil has amazing health benefits. It hydrates and softens skin and is a great source of Vitamin E. It is suitable to be used on skin and hair. Avocado oil for the Hair: Regular use of avocado oil stimulates the blood flow in to the hair follicles. This in turn increases the hair growth and makes the hair healthier. The avocado oil contains Vitamin E which also gets well absorbed into the scalp and the hair shafts. Avocado oil for the Skin: The avocado oil not only hydrates and softens the skin, but also is highly recommended as a treatment for acne and blackheads, eczema and other forms of skin inflammation.